Fans of Novomatic slots may have noticed that they launched a follow up to the hugely popular Reel King video slot with a game called Rainbow King. We have tried this out a few times in the casino but it's a tricky slot to come by. Good, then, that Novomatic have launched this online version which should see players get their fix in the comfort of their front room. 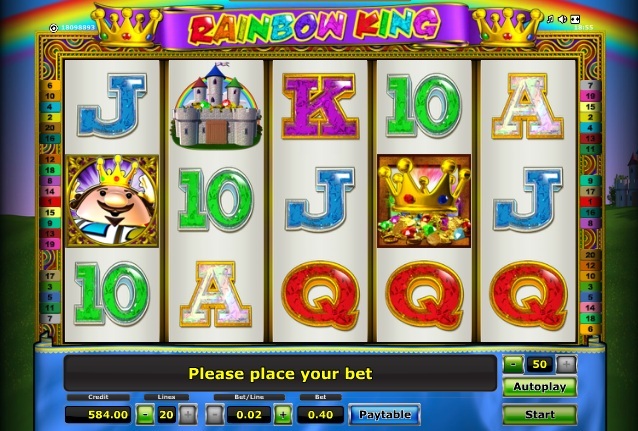 Rainbow King is a 5-reel, 20-payline online slot which stays pretty true to the style and look of the land-based original. As you'd expect, regal symbols make up the bulk of the icons here, like crowns, castles, a portly king and a pile of gold. Gold-edged 10-through-Ace icons make up the numbers. There are three different bonus rounds in Rainbow King, which makes things quite interesting. Two of them are Pick 'em-type bonuses and the other one involves rolling a dice in a sort of Trail Bonus. To trigger any of the bonus rounds you need to see 3 or more scatters in view on the reels. Either a castle, crown or the rainbow king are scatters, but they need to match to activate the bonus. 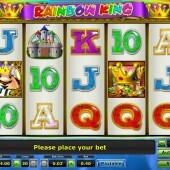 If you enjoyed Reel King then there is a good chance you will like this slot. If you're still on the lookout for solid slots fare, however, you should check out some other classic Novomatic slots like the Egyptian-themed Book of Ra Deluxe or the adventure-packed Columbus Deluxe.